Chef Vikramjit Roy is known to do things differently. A strong believer in progressive cuisine, he questions the validity of ‘authentic recipes’. “I have documented 182 recipes of Thai green curry from a trip to North Thailand,” he says, “so which one would you call authentic? Almost every north Indian household has its own take on the ubiquitous rajma, as do Malayali families on the meen moilee.” So it is not surprising that while most restaurants introduce menus to celebrate the start of a season, Chef Vikram even finds reason to create special dishes to mark the end of a season. The End of Winters menu at Tian – Asian Cuisine Studio is based on ingredients that will be available only for a short period now. “It showcases today’s food – not yesterday’s, not tomorrow’s,” he says and adds that this philosophy is also very much in line with the ITC Hotels’ endeavours to reduce carbon footprint and promote responsible luxury. From green peas to black carrots, even certain lentils from Punjab that according to Chef Vikram have a unique flavour in the current month, find pride of place in the dramatic presentation of a 10-course menu. 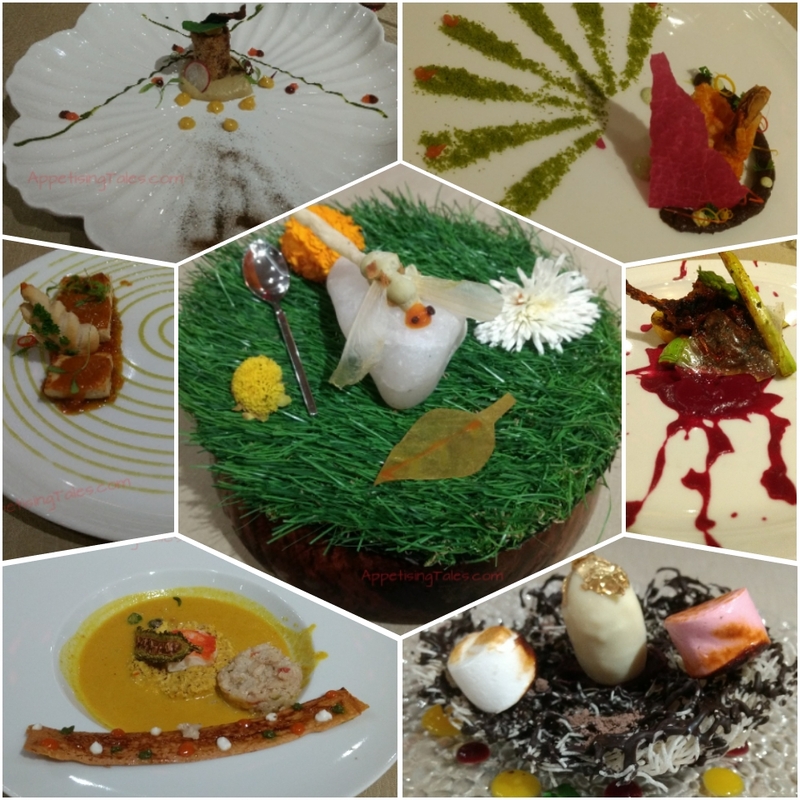 Even though he claims to have gone easy on the presentation while pushing for techniques in the kitchen, his artistic inclination is sure to take you on a gastronomic experience that’s enthralling, evocative of some familiar flavours with completely surprising ingredients. So an amuse bouche that seems to have burrata and cherry tomato has neither, and Thai curry and rice is presented in a way that you would never imagine possible, yet tastes very much like one would expect Thai curry and rice to taste! Coming back to the 10-course extravaganza, I am wondering whether to reveal the details of my experience or if I should leave you with just a few glimpses so that you may enjoy the show as much as I did. Yes, you read right! I did call it a ‘show’. It is in fact story telling in its most creative form with dishes named as Grass, Fog & Smoke, Cyclone, Aftermath, Snowfall and finally Sleep. From prawns, Bay of Bengal bekti, steamed chicken tartar, lamb chops, halibut and crab, non-vegetarians are well taken of, as are vegetarians with corn cakes, sweet potato, herbed tofu, soya chops, braised daikon and seasonal vegetable dumplings. I will now leave you with a collage of pictures that is enticing enough to make you want to try this menu for yourself, without divulging the details of the dishes so that they may be revealed to you as dramatically as they were to me. Tian, ITC Maurya, Sardar Patel Marg, Diplomatic Enclave, New Delhi. Rs 5,000 plus applicable taxes.